Background : Son of William and Elizabeth Alice Mannering Batten, of Currie, King Island, Tasmania, Australia. Fiancee of Elsie Jean McDonald. Service & personal summary At enlistment : single. No previous military experience. Brown eyes, brown hair. Marks / scars : appendectomy scar, small scar left knee from motor accident. 21/05/1941 Taken on strength Recruit Reception Depot Royal Park, Victoria. 23/05/1941 Granted leave without pay 23/05/1941 to 29/05/1941 inclusive. 30/05/1941 Rejoined unit from leave without pay. 04/06/1941 Transferred to Southern Command Engineering Training Depot. 05/06/1941 Transferred from Recruit Reception Depot to Engineering Training Depot (Pioneer Wing) Puckapunyal, Seymour, Victoria. 08/07/1941 Posted to 3rd Reinforcements 2/2 Pioneer Battalion. 08/07/1941 Graded Carpenter Group II. 26/08/1941 Promoted to acting Corporal. 09/10/1941 Promoted to acting Sergeant. 29/10/1941 Posted to Reinforcements 2/2 Pioneer Battalion. 02/11/1941 Embarked Sydney, New South Wales on H.M.T. L.L. Convoy 13. 26/11/1941 Promoted to acting Corporal. 30/12/1941 Reverted to Private on evacuation to hospital. 30/12/1941 Evacuated to 1 Australian General Hospital with mumps. 10/01/1942 Discharged 1 Australian General Hospital and marched into Convalescent Hospital with parotitis. 21/01/1942 Marched out to 2/2 Australian Pioneer Battalion. 21/01/1942 Taken on strength from Pioneer Training Battalion. 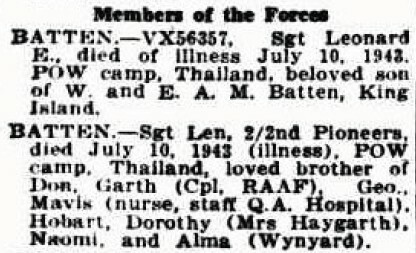 19/08/1942 Reported missing in action believed prisoner of war. 28/07/1943 Reported prisoner of war, Java. 10/07/1943 Died of illness whilst prisoner of war (Beriberi), Thailand.